2013 has been an awesome year for the company and they have seen some of the finest companies and products come on board. It is with great honor we announce the winners of this years Best of the Year Award! PHOENIX - Dec. 22, 2013 - PRLog -- Family Review Center has been a leading force in family friendly product reviews since 2000. With a full review and award center, along with offering reviews that are free and unbiased, they have become one of the first and foremost places to go, when a company wants their product to gain the recognition and admiration it deserves. 2013 has been a great year for the company and has seen many new companies, as well as returning companies, sharing some of the most awesome products they have yet to see in the 13 years they have been around. The panel of judges had a rough time deciding which products in the different categories that would be the winner, as the competition was fierce because the products reviewed were all so awesome! The selection has been finalized and the company has unveiled the winners of this most prestigious award! They are now ready to share the winners with the world and you will be sure to find products that you will love and cherish within this year’s winning products. You can rest assured that if Family Review Center has endorsed the product by awarding it with this great honor, you will be happy with your purchase when they time comes that you need such a product. SleepBelt (review #2995), Little Hearts Books LLC (review #3019 & review #2980), Learning Wrap-ups, Inc. (review #2923) Little Bean Creations, llc (review #2928), Custom Nail Solutions (review #2928), BubbleBum (review #2929), The Orb Factory (review #2911), Bridgestreet Toys (review #2927), Chibebe (review #2901), Camera Coats (review #2773), Fat Brain Toy Co. (review #2785), Olen Cosmetics Corporation (review #2795), PlayMais Canada Inc. (review #2762), Birthing Gown (review #2791), Johnette Downing, Wiggle Worm Records (review #2766), D.L. Carroll (review #3025), Funbites (review #2982), Mutt Managers (review #2856), McNeill Designs for Brighter Minds, Inc. (review #2796), NumbersAlive! (review #2960), Hanz Toys (review #2915), BityBean LLC (review #2863), ArroWorthy (review #2897), Mage Company (review #2782), Edupress (review #2835), Growing Sound (review #2948), Monkeying Around (review #2864), Wristease LLC (review #2942), Constructive Eating (review #2899), Little Dundi LLC (review #2865), Kidsemail.org (review #2849), The Farties Inc. (review #2783), Sukugo LLC (review #2833), Aoede (review #2993), Discover with Dr. Cool (review #2984), Swifty Snap LLC (review #2991), Kidaroo Crew (review #2756 & review #2757), Fancy Nancy The Musical (review #2979), EZ Squeezees (review #2998), and PetitBoo (review #2987). Congratulations are well in order for each of these companies and the fine products they represent, which won the award. 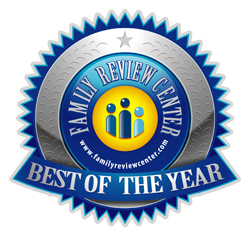 To view the reviews above just stop by the Family Review Center website: www.familyreviewcenter.com and click on “Reviews”, at the top of the page. Then simply enter the review # above that you wish to read. You will instantly be taken to the review, where you will find a complete description of the product, a photo of the product and the notes by the reviewer, about the product. From there you will have access to the company’s website, Twitter page, Facebook page and Pinterest page (as applicable), along with the price of the product and the age recommendations for it. Family Review Center welcomes your questions and comments on any products or content within the website. They love hearing from their viewers and being of service to them. You will find this to be a company who goes above and beyond in lending a hand to both the companies they work with, and the viewers of the website. It is all about meeting the needs of those they serve. Family Review Center is open to receiving products for review. Should you have a new product you wish to have reviewed and to have freely marketed to the max, you are encouraged to click on the submit button the site, and send your product in for a professional review for 2014. Merry Christmas to all and to all a good Year!! !